David Sheryka, a longtime member of the Reno Chess Club, passed away on May 25th. David once sported an Expert rating and continued to play Class A chess for the past 20 years. In his honor, and with the generous sponsorship of David’s relative, Jerry Weikel will run a 6-round swiss tournament. Format is a 6-round swiss with rounds 1-3 at Game/30;5 second delay on July 7th and rounds 4-6 on July 14th. Cash prizes will be awarded: 1st: $100, Top A: $50, Top B: $50, Top 1599-below: $40. The Nevada State Scholastic 2016 took place Saturday, March 12th at the Las Vegas Day School, 190 players from all over the valley and even Reno participated, the event was organized by Nevada Chess. The players were grouped in four sections based on age and school grades: K3, K5, K8, K12, with sections K3, and K5 playing six rounds and K8, K12 five rounds. The venue offered a lot of space for kid activities in between rounds such as basketball, soccer, etc. the weather was also magnificent. Over the board the action was intense and very competitive, K3 and K5 were dominated by Shenlone Wu and Chris Bao respectively with a perfect score of 6 out of 6, K8 section was a tough one with a few high rated players on the roster, at the end when the smoke of the battle cleared, Aayan Patel from Reno emerged on first place, he also will be the State representative for the Barber tournament. 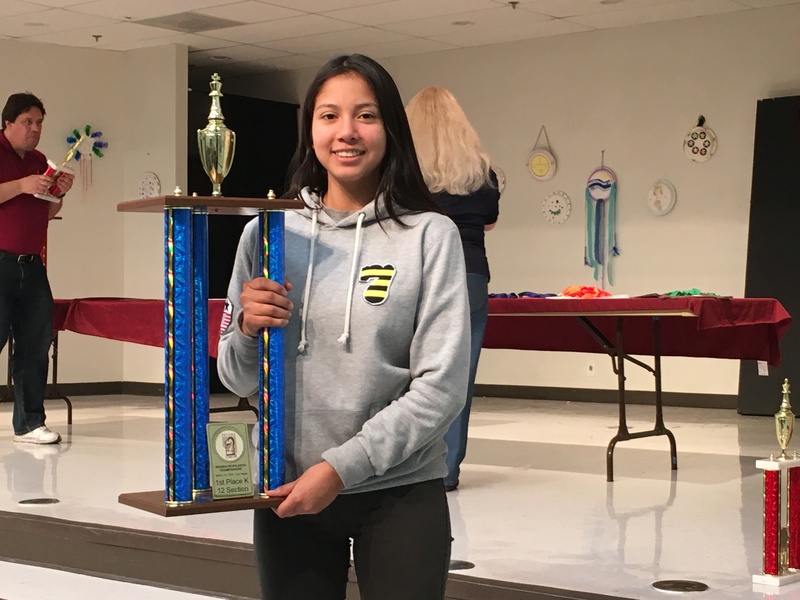 The K12 section as expected was a highly contested section, Naomi Santiago and Ishan Saran tied for first with 4.5 points each but tiebreaks favored Naomi, who became the first female ever in the State history to win the High school championship. Naomi is planning to play on both, the Susan Polgar girls tournament and on the 2016 National girls tournament of Champions, the later one will be held on Indianapolis on July- August, representing Nevada. The Co- Champion Ishan Saran will present us at the prestigious Denker tournament. This year the top finisher in each event will also receive a $5,000 scholarship that can be used at any University or College. In addition, the top finisher in the Denker Tournament will receive a spot in the US Junior Championship, the top finisher in the Barber Tournament will receive a spot in the US Cadet Championship, and the top finisher in the National Girls Tournament will receive a spot in the US Junior Girls Championship. The top finishers in the three events will also qualify for the World Youth Tournament. The team’s competition was also very exciting with St Viator Catholic School winning K3 and K5 followed by Saint Elizabeth Seaton Catholic School on second, and Las Vegas Day School on third. The K12 was won by Advance Technologies Academy power house, they were the winners of the 2014, and 2015 edition too. We would like to congratulate the winners; we wish them the best! Thank you to all the participants and to the volunteers and the support team from Las Vegas Day School. Thank you also to the parents for their support for Chess. We will meet again on 2017! Entry Fees increase after February 25th and again after March 7th. Click Here to Learn more about this event and enter today.